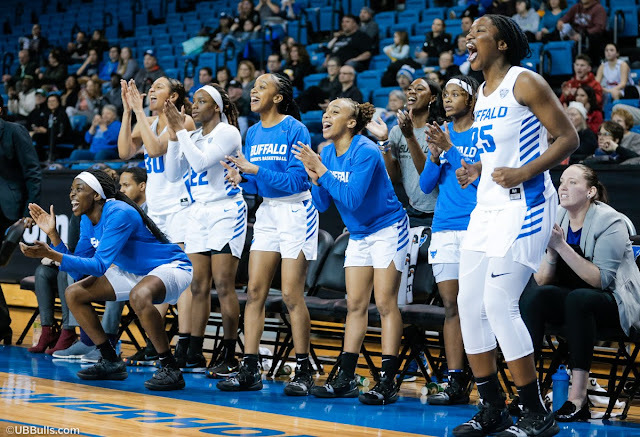 BUFFALO – The University at Buffalo women's basketball team outscored Toledo 47-27 in the second half to overcome a ten point halftime deficit and defeat the Rockets 73-63 at Alumni Arena on Wednesday night. With the win the Bulls improve to 15-5 on the year, 7-2 in league play. Summer Hemphill led the Bulls with 19 points, while adding seven rebounds, three blocks, one assist and one steal. Cierra Dillard added 17 points, 15 in the second half, to go along with nine assists, four rebounds and six steals and Brittany Morrison also got into double figures with 14 points, while pulling down three rebounds. The 47 second half points were the third-most scored by UB in a half this season. "Give credit to Toledo," head coach Felisha Legette-Jack said. "Tricia Cullop is one of the best coaches in the country in my opinion. They have a fantastic team, but we have a good team too. We kind of looked like we didn't belong out there and we talked to them a little harshly at halftime to remind them that they do matter and they are enough." It was a rough start for Buffalo as Toledo jumped out to an early 9-4 lead. The Rams would make just three field goals in the opening quarter and the Rockets scored eight points off 10 UB turnovers to take a 17-8 lead through one. Buffalo started to get things going in the second, using a quick 5-0 run, capped by an Adebola Adeyeye offensive putback, to cut lead to six with 3:05 to play. Later, Marissa Hamilton drilled a triple to cut the lead to four with 1:48 to play but the Rockets responded with a 6-0 run to end the quarter and take a 36-26 lead into the break. The Bulls offense came out on fire to start the third quarter as UB hit its first eight field goals coming out of the break. The run started with an and-one by Theresa Onwuka and would continue with back-to back buckets by Hemhill and a layup by Morrison to cut the lead to one. Buffalo would take its first lead of the game, 43-42, on a pair of free throws by Onwuka. Dillard's first field goal of the game would be a big one as she drained a transition three to put the Bulls up 46-42 at the media timeout and UB would take a 53-52 lead into the final period. Toledo would even the game 58-58 early in the fourth but that would be as close as they would get as Buffalo outscored the visitors 20-11, including 7-of-8 from the charity stripe, in the final quarter to secure the victory. Buffalo outshot the Rockets from the field, from beyond the arc and from the free throw line and scored 22 points off of Toledo's 19 turnovers, while also scoring 16 points in transition. Up next, Buffalo hosts Kent State on Saturday at 1 pm. It is the first game of a doubleheader with the UB men's team.